«« previous: Quiz: What am I? I spent half my time last week being sick with a cold, and the other half working on a new plugin for Lightroom that I knew I'd never use myself, nor would it be of any interest to most people. This plugin allows you to extract as individual JPG files the internal preview images that Lightroom makes for a catalog. If you don't have your original image files handy (because you've deleted them, or you forgot to bring the drive that contains them with them) and you need something, this might help you out of a pinch. So the real “I'm an idiot” moment was – after I finished the plugin – finding out about Marc Rochkind's most excellent-looking LRViewer tool, which looks just awesome in that it does what my plugin can do and so much more: it uses the image cache and the Lightroom database to offer a full-function (but read-only) image viewer that doesn't require Lightroom itself. Had I known about LRViewer, I probably wouldn't have bothered writing this plugin. But, I did waste a week on it, so here it is if you care. The full list of my Lightroom plugins is on my Lightroom Goodies page. Even though I probably will not be using this one, I just have to say that I love your plugins. I use the smugmug and flickr upload ones and your Geoencode plugin. Thanks for all your effort! It is very much appreciated. Thanks for the plug (! ), Jeffrey. I am a Mexican reader of your blog, who discovered some time reading about the D700 and “the impossible pictures”, you’ll appreciate your input as well as applications for Lightroom, which is excellent, i use the goodies, flickr, facebook , and recently metadata wrangler GPS support, whit my iphone and “trails”. I really thank you for this excellent utility, are great, thanks for your work by produce, and by the time devoted to an incalculable number of people who enjoy your free tools, and what a shame you’ve spent a part of your time on something that was done, but never mind, your work is great, congratulations. Thanks for plugin, i think, it’s right what i need. I know about LRviewer, but for some strange reason it’s don’t works for me. Alexey: Let me know how LRViewer is not working… perhaps there’s something I can help with. Marc, it’s open LR database from other PC via local network, but i can’t see any photo, except those, which placed in Quick Collection. Color management also fails. I didn’t think it’s a problem of your soft, possibly some faults of configuration of our PC (localization of winXP, etc). I have been looking for one like this for ages. 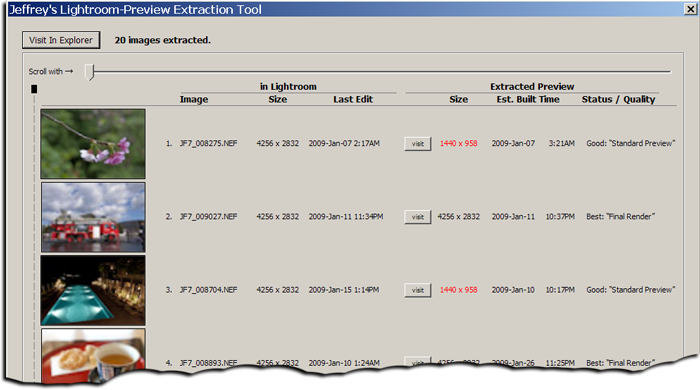 I Looked at LRViewer but it can’t extract the jpegs from the previews. Sorry, I meant that LRViewer is made for a different purpose and can’t save jpegs from the previews but the above tool works well for extracting the previews. I never noticed that as I have never read the manual. I just looked at LRViewer now and found the menu item. My name is Nico and I live and work in Taiwan as photo director for one of the top wedding company here. I just want to say “THANK YOU”, you saved the day! I was able to retrieve images from one of our photographer’s computer after his HD died. Thanks so much! keep up the good work, I’m a fan now! I recently erased the original raw files from my HD. They are definitely gone. I have downloaded and installed your extraction tool into Lightroom. I have large sized previews of the deleted images in my Collection and Catalog folders. When I do the Export command, I get a pop-up dialogue stating “Some export operations were not performed” and beneath that, a file structure tree showing (file does not exist). What am I missing? This plugin is exactly what I needed to retrieve the JPEG previews of all my RAWs that were lost. PreviewExtraction plugin works fast and shows thumbnails of all the JPEGS it has extracted but when I try to view or open any of the extracted files I get varying errors stating in one form or another that the file is locked. I can go into the file properties and change the permissions, one file at a time, and then all is good. Is there something I am missing that is causing the extracted images to be locked initially? Again, thank you for this plugin. It has made me very happy today!